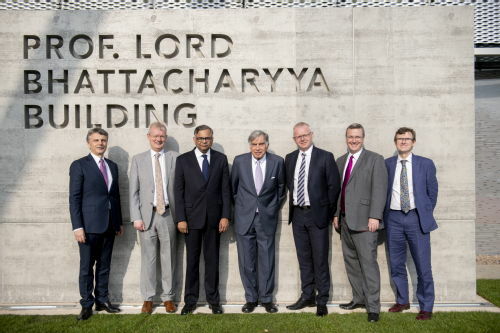 Coventry City Council, working with the University of Warwick, has taken the unusual step of arranging with the University to have a road named after Professor Lord Bhattacharyya. The road running past the Prof. Lord Bhattacharyya Building (the home of the National Automotive Innovation Centre) will now be known as Lord Bhattacharyya Way. “We wanted to celebrate and honour a man who has done much for Coventry – helping to promote the skills of the city around the world. “We are proud to be recognising a man who has done the same for business and employment and who not only has an amazing drive, commitment and passion for manufacturing – but also for seeing it succeed in our city. Our Professor Lord Bhattacharyya was honoured to deliver the keynote speech at the prestigious Zienkiewicz Lecture, at Swansea University’s College of Engineering, on Wednesday (28th November). Professor Lord Bhattacharyya delivered a lecture entitled: ‘The mobility revolution: How innovation in automotive energy systems, intelligent vehicles and service customisation will transform how we travel,’ before being presented with a commemorative medal from Professor Roger Owen. This has led to the exciting new EPSRC Tata Steel Prosperity Partnership flagship investment in long-term use-inspired fundamental research, where Swansea University and WMG come together to create a new ‘virtual factory’ for rapid alloy prototyping. Professor Lord Bhattacharyya began his career as graduate apprentice at Lucas; subsequently gaining an MSc in Engineering Production and Management, and PhD in Engineering Production at the University of Birmingham. A new multi-million-pound ‘Smart City Mobility Centre', to be established in Warwickshire and the West Midlands was announced last night (Monday 12th November 2018) at the Coventry and Warwickshire Automotive Dinner in Warwickshire’s Coombe Abbey Hotel. WMG Chairman Professor Lord Bhattacharyya announced that Europe’s first multi-million-pound Smart City Mobility Centre will be based at the University of Warwick’s Wellesbourne campus, with driverless capable vehicle testing on the University of Warwick’s campus in Coventry and Warwickshire. The Centre brings together WMG’s research expertise and Jaguar Land Rover’s leading research and engineering capabilities. The Chancellor of the Exchequer has announced that the West Midlands Combined Authority (WMCA) will receive up to £20 million, subject to approval of a satisfactory business case, to enable WMG, at the University of Warwick to create the UK Mobility Data Institute, a focussed research centre to collect, process and analyse transport data generated by the advent of new mobility technologies such as autonomous vehicles and smart charging of electrified vehicles. The announcement was made in the publication of the Chancellor of the Exchequer’s full budget following his Budget 2018 speech on Monday 29th October. Data aggregation and analysis will underpin the future of all transport systems and how they are built, regulated and used. At the heart of the UK’s first 5G urban connected area and the home of future mobility innovation WMG, working in partnership with WMCA, will create the new data institute. It will provide the computing, technical and connectivity capacity and expertise to bring together and exploit, for economic, productivity, social and environmental gain, the huge amount of data generated in many transport programmes. Professor Lord Bhattacharyya received an honorary Doctor of Science degree, from the Kalinga Institute of Industrial Technology on 10 September 2018. At a ceremony held at Kalinga Institute of Industrial Technology (KIIT) in India, Professor Lord Bhattacharyya was conferred a D.Sc (honoris causa) in recognition of his contribution to engineering and academic leadership. Professor Lord Bhattacharyya is a long term and committed collaborator with India, with WMG working with many companies on research and development, as well as educating future engineers, technologists and managers. Lord Bhattacharyya began his career as a graduate apprentice at Lucas Industries, subsequently gaining an MSc and PhD in Engineering Production at the University of Birmingham. In 1980, he became Britain’s first ever Professor of Manufacturing setting up WMG, at the University of Warwick. Since then he has built a world-class research and education group, working with industry to innovate and develop the leaders of tomorrow. Today, WMG employs over 700 people across research, teaching, professional and administration. There are a total of 19 different research groups working across multiple sectors, and to date over 35,000 students from across 75 countries have studied here. A new research project, Tucana, will focus on lighweighting technology, delivering stiffer and lighter vehicle structures with the help of experts from WMG, at the University of Warwick. The research will develop world-leading cost effective, scalable carbon fibre composite solutions, with the view to boosting the performance of electric vehicles. The CO2 benefit of the project between 2023-2032, will be 4.5 million tonnes. WMG will receive £4m, of the £18.7m government funding through the Advanced Propulsion Centre (APC), to drive the development of innovative lightweight vehicle and powertrain structures, building on the UK’s leading-edge capability in this area. Project Tucana will allow the true environmental credentials of electric vehicles to be realised by enabling wider adoption. Tucana will deliver this step-change by addressing structural performance at a design, material and volume manufacturing-level which is currently unmet across the industry. Professor Lord Bhattacharyya received an honorary degree for his contribution to advance the knowledge of technology and its widespread application throughout the world including India. The award was conferred on 8 September 2018. At a ceremony at the Indian Institute of Information Technology at Allahabad, which is the largest of its kind in India, Professor Lord Bhattacharyya was conferred a D.Sc (honoris causa) in recognition of his contribution, and creation, of WMG with its world renowned application of cutting edge technology.